How Do Career Insurance Jobs Differ From An Hourly Or Salary Job? becoming a life insurance consultant. Watch this short career opportunity video. Insurance Jobs can create unlimited opportunities. 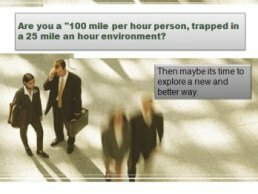 If you are what I refer to as a "100 mile per hour person, trapped in a 25 mile an hour environment." If that is how you feel, then selling insurance may be a good career change for you. So take the time to investigate your options. Our website can help you. Once you check out the different opportunities, you can use our insurance forum to ask further questions. Learn about the different types of Insurance Sales Jobs available to you, as well as a number of related topics on a possible Insurance Career. The different Insurance jobs discussed on this topic page can provide you the opportunity to create your own career. You will have the chance to work for yourself; become your own boss, build your own business, and the sky is the limit. This topic page provides some of the pros and cons as related to the different insurance jobs, and can link you to other key pages about this subject. ..plus many more specialty areas. What can be expected of me in the Early Years ? What do I have to do to become a successful life insurance agent ? Is becoming an insurance agent right for me ? What is a Captive Life Insurance Agent ? What is an Independent insurance agent or broker ? Selling techniques and Lead Generation Idea's ? Should I Consider Having my Own Personal Website? Investigating The life Insurance Career Opportunity. In my case, I floundered around till I was 26 years old before I found the life insurance business and decided to become an insurance agent and eventually an insurance recruiter and trainer. Because of the financial planning knowledge I gained and put into practice for myself, I was able to retire at the age of 58. So if you work hard and smart, you may be able to enjoy early retirement also. One of the first things my wife and I done when I decided to become an insurance agent and come into the business was to get a list of the successful insurance agents that lived in our town. We then went out and drove by many of those beautiful houses. We were able to see what could happen to us if we committed to this career. During my early years, when I was having a "downer week" or things were not going very well, there were many times I drove by a couple of these houses, to get me pumped back up and remember why I got into this business. This was one of my self motivation programs that I developed to motivate me. Today’s insurance jobs have less competition than about 10 years ago. The reason for this is that insurance company hiring practices, state licensing requirements, insurance continuing education requirements, and problems with errors and omission insurance started to make it harder for the part timers and those really not committed to the business to stay in the business. I would venture to say that there are only about 1/3 of the licensed insurance agents today as there were ten years ago. So if I become an insurance agent today, How does this impact Me ? Quite simply, it now gives you a bigger piece of the pie, with less competition. If you qualify for an insurance sales job and get the opportunity to become an insurance agent, you will be entering the life insurance business during a prime time. Somewhere when I was investigating the different insurance jobs and decided to come into the insurance business, I read that 83% of the income generated is made by sales people and 17% is made by the hourly worker. It was at this point that I decided that I wanted to be on the power side of that curve. The 83%. What about you? And if you do qualify for one of the many insurance jobs and do come into the insurance business, you must clearly understand that your number one mission objective is to generate new clients and premium income for the insurance company that hired you. Let me say that one more time. Your mission objective is to generate new clients and premium income for the insurance company that hired you" and for this you will be handsomely compensated, as your income will be generated from first year commissions and renewals. Is working for someone else really financial security? Most people looking into the different insurance jobs and wanting to start selling insurance are usually working on an hourly basis or for a salary. So when I was an insurance recruiter, and explained that our income is derived from commissions, many times their response was "boy I don't know if I feel secure working on a commission type business? "My response was what is security? How secure is that weekly paycheck? Think about it, when you are working for someone, you are basically two weeks away from a pink slip, if they decide to lay you off or fire you. How much security is that? As you grow in this business, your income will consist of 1st year commissions and renewals. It is that growing income which is one of the fantastic benefits about this business. As we discussed, there are a number of insurance jobs. Find the one that trips your trigger and you can make a lot of money, and have the financial freedom of that 100 mph person. Help us by writing a short testimonial and see what other readers liked about our site.